If you think it’s no big deal to forget to take a needed medication or choose not to take medication as prescribed by your doctor, think again. Medication nonadherence results in 125,000 deaths each year, according to the American Society on Aging and the American Society of Consultant Pharmacists Foundation. A 2009 study from the New England Healthcare Institute found that nonadherence costs the U.S. healthcare system $290 billion annually. Medication nonadherence can be a problem for any age group, but the problem is especially acute among older adults since many of them take multiple medications. And the health consequences of nonadherence for elders can be particularly severe. In an effort to improve medication adherence among this age group, the Burbank, CA-based Front Porch Center for Technology Innovation & Wellbeing has launched Minding Our Meds: Demonstrating Senior Medication Adherence With Cell Phone Texting Reminders, a project that uses cell phone texting to remind older adults to take their medications. In late 2011, the center received a $77,150 grant from the Center for Technology and Aging to deploy Minding Our Meds and develop a model for other organizations to follow. Officials from the Front Porch Center are optimistic that the combination of cell phone mobility and the convenience of texting will allow Minding Our Meds to succeed where more static educational efforts, such as print brochures, may have failed. The Front Porch Center is part of Front Porch, a nonprofit organization that operates active adult, retirement living, and affordable housing communities in several states. Formally established in 2009, the center focuses on deploying emerging technology that helps people manage their health and remain active and independent. The Minding Our Meds project aims to reach 150 older adults from Front Porch’s communities and neighboring senior centers. Front Porch plans to recruit participants through outreach efforts such as community presentations. The older adults will be split into two cohorts, and each cohort will participate for five months. The project is expected to wrap up this summer. To be eligible to participate, an older adult must be at least 50 years old, have a cell phone with texting capabilities, and be on at least one medication regimen. Enrollees will go to a training session where they will go through an intake and registration process, and they will be shown how the program will proceed. Participants will be given gift cards to help defray the cost of texting. The technology used in the project is the Mobile Medication Manager service from New Jersey-based CareSpeak Communications. The service sends text messages to subscribers’ phones to remind them to take medications at the right times and in the right amounts. The service also can be set up to send text messages to a caregiver when a subscriber does not comply with a medication alert. The Front Porch Center has hired a consultant from the University of California, San Francisco’s Institute for Health & Aging to develop evaluation tools to track medication adherence, user satisfaction, and overall health during the project. This information will be used to help determine how the project could be expanded and replicated among other organizations. Is Texting a Viable Approach? But are older adults using texting enough to allow projects like Minding Our Meds to have an impact on medication adherence? Increasingly, the answer is yes. Fifty-eight percent of American adults aged 50 to 64 and 24% of adults aged 65 and older use their cell phones to send or receive text messages, according to a 2011 report from the Pew Internet & American Life Project. Pew also found that 78% of smartphone owners aged 50 and older use their phones for text messaging. The aging baby boom cohort should significantly boost the number of older adults engaged in texting, says Barry Hix, MBA, MPH, general manager of healthcare solutions for 3Cinteractive, a mobile software and services company in Boca Raton, FL. Mobile phone technology provides an opportunity for continuous, interactive communication between patients and healthcare providers, he says. The experience of some communications companies shows there is significant demand for technology-enabled medication reminders. In June 2011, California-based GreatCall, Inc., best known for its Jitterbug cell phone designed for older adults, introduced an iPhone application called MedCoach. The application helps users follow their medication regimens, track adherence, and connect with pharmacies. The application has been downloaded more than 10,000 times so far, says Madeline Pantalone, GreatCall’s vice president of strategy and business development. At times, MedCoach has attracted as many as 200 to 300 downloads in one day. “It immediately took off. For something aimed at the older adult market to get a reaction like that is pretty good,” Pantalone says. Maura Conry, PharmD, MSW, LCSW, a pharmacist and social worker in Kansas, believes that technology such as cell phone texting will prove helpful in improving medication adherence. But, she adds, reminders to take medications are only one part of the equation. Other reasons why older adults choose not to take medications include cost, fear of side effects, a lack of understanding of why they need the medications, or a belief that the medications won’t work. “The reasons are way more complex than just forgetting,” Conry says. Social workers are well equipped to address the problem of medication nonadherence because they understand the role that behavior and behavior change play in adherence, says Ide Mills, LCSW, senior vice president of health education for HealthEd Encore, a healthcare marketing agency in Clark, NJ. Education alone won’t address the problem, she says. Social workers can serve as a bridge between older adults and their medical providers, Mills says. 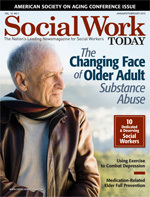 Social workers also can help make sure that interventions to improve medication adherence are delivered in a way older adults can comprehend.